Yesterday saw the sad day of little Toby Nye being laid to rest but not before Leeds fans lined up outside the East Stand to give him a fantastic send off. Sleep tight little man and my thoughts are with all your family and friends. On a personal level this last week is one I hope my family never has to go through again. My stress levels were already through the roof at work when the news we dreaded happening was confirmed. This all ended badly yesterday when my youngest daughter sadly lost her dog. When my children hurt, I hurt, so a sh*t week got even sh**ter. I need my Leeds United family to get me through the bad times and reduce my stress!! I should remember this is Leeds United I am talking about, but seriously this is my get away from it all to keep me going. We left the Peacock at 12.45 pm for the short trip to Rotherham with me sleeping all the way there. As we headed to the turnstiles it was nice to see Phil Thumbsup Cresswell back again after his recent illness and catch up with a chat. Thanks should also go to those people I spoke to before the game as their support is invaluable. I’d heard we weren’t allowed our flags up today for some reason but thought I would still check it out. Apparently because it was a full house there was nowhere to put them!! I beg to differ with the full house, as there were plenty of empty red seats around the ground. Last season we had hung them in front of the top disabled area with no issues so why couldn’t they go there again? What a ridiculous decision from my point of view, because what harm do they do but show how far and wide our support is? The team: Today saw the debut of our goalie from Real Madrid, Kiko Casilla, Ayling, Cooper, Phillips, Alioski, Klich, Roofe, Hernandez, Clarke, Harrison and Forshaw. Subs: Roberts for Clarke (45), Shackleton for Harrison (88) and Davis for Hernandez (90 + 6). Leeds won the game 2-1 with Klich scoring both our goals (51) and (86) after we went a goal down in the 25th minute. Attendance was 11,259 with 2,317 Leeds fans. As the game kicked off Leeds had a lot of possession but it seemed like we were trying to walk the ball into the net and not really getting any clear chances to score. Rotherham didn’t look too much of a threat for a long period then suddenly upped their game. As I was telling Leeds to step up a gear too, Rotherham let fly with a long range strike that beat Casilla into the top corner to put them into the lead. That dé ja vue moment once again as the first half died a death from our point of view as it looked like history could be repeating itself. Despite a couple of attacks our best moment came with a shot from Harrison bringing out a good save from their goalie to leave us a goal down at half time. My stomach started to churn with that familiar feeling of things going wrong. A few of us ladies had a chat at half time about the game and then I said, “Right, we need a positive mental attitude and Leeds are going to win.” Another one said yes we are going to win 3-1! Well the score may have been wrong but we did the trick so well done girls! With the second half underway, it became clear that if we put pressure on Rotherham they would get nervy and wilt. Within six minutes we were level when Rotherham failed to clear the ball, handballed it in the process, but Klich was able to poke the ball home from close range. It seemed an age before it went over the line but Leeds got straight on with the game as the Leeds fans celebrated. Their goalie pulled off a couple of saves before Casilla made a great save to deny Rotherham a second goal. We started to put some pressure on Rotherham’s goal and you could see their players starting to panic. As they started time wasting I said I hoped we could make them pay for that and get the winner. After some great play from Harrison on the left in front of us, the ball came across to Klich in the middle who struck a great shot into the corner of the goal to send the Leeds fans wild. Klich is scoring goals, was sung again and again and as I love the singing and chanting, this is just what I needed plus the win and three points of course. To say only four minutes added time was on the board the game kept going for nearly three minutes more which sadly saw Phillips booked as he took one for the team and Hernandez go off with a possible injury. As we headed out of the ground into the rain which had apparently been falling during the second half too, Leeds stayed top of the league. This was one of those games that we had to win and although still a long way to go Leeds, just keep getting the points please. Next week sees the late kick off against Norwich who are one of 11 clubs who have written a letter to the EFL demanding an investigation into Leeds and spygate. All I can say is they need to grow up because Leeds did nothing wrong. If you train in public and anyone watching is on public property, then my answer to those 11 clubs is tough! 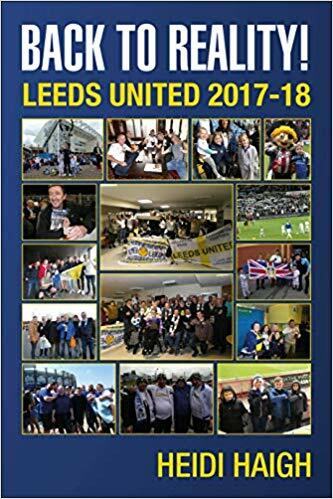 I want to get to the game in good time as I am meeting one of the Nottingham Whites who managed to order my book Back to Reality, Leeds United 2017-18 from WH Smith. He wants me to sign it for him so will look forward to meeting him to do just that. See you there, LUFC – Marching on Together.